4-H has grown in California because of the dedication of our volunteers. Some of our volunteers have supported 4-H for 10, 20 and 30 years or more! All 4-H volunteers must be appointed annually. 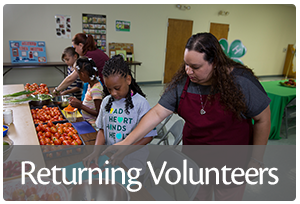 If you are a current 4-H Adult Volunteer, to continue in the next year you need to re-apply and be re-appointed by December 31st to continue with no breaks in service. 1. Update your 4hOnline profile. Log in to 4hOnline to update your profile to enroll for the new year. Please make sure the email address in the system is correct and one you check regularly. 2. Take the Returning Volunteers Training in the on-line eXtension system. You will receive the login information sent to your Family e-mail after you update and submit your 4hOnline profile application for the new year. If you used a paper enrollment form, you will have to check with your county 4-H Representative for the instructions. 3. Get approved as a 4-H Volunteer. After all the application requirements and mandatory trainings are completed, the County Director reviews and approves the volunteer appointments. You have a break in service if you are not currently enrolled as a 4-H volunteer when you apply for the new year. Please follow the process for New Volunteers when applying.